As usual, Fuller Center for Housing Armenia has been bustling with activity all summer long, having hosted seven Fuller Center Global Builders teams in addition to its numerous other partnerships that help put Armenians in simple, decent housing. And this summer will go down as the summer that Fuller Center Armenia has dedicated its 200th house since becoming a covenant partner in 2008. 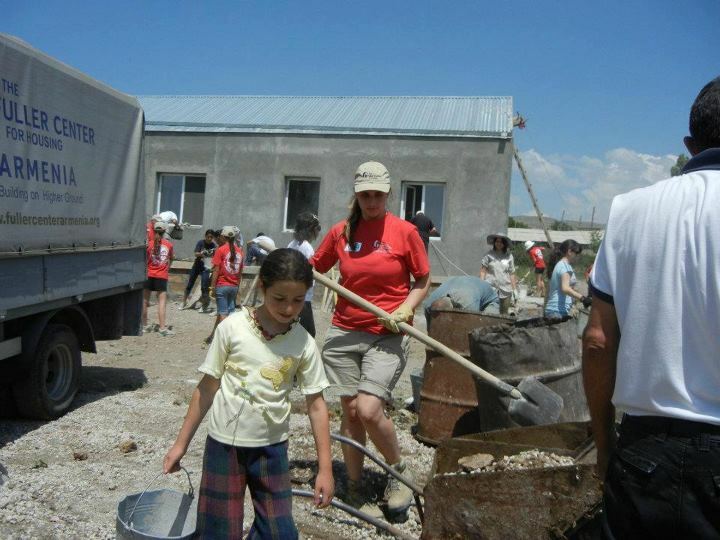 The Fuller Center’s work has long been needed in Armenia, especially after the former Soviet Union state suffered a devastating earthquake in 1988. In the wake of the disaster, metal shipping containers were sent to Armenia to be emergency shelters, but thousands of families have lived in the containers known as “domiks” ever since. Among those are the Manoukyans, our 200th partner family in Armenia. The family of six from the village of Areni in the Vayots Dzor region had been living in a domik for many years in unbearable conditions without a kitchen or bathroom. They had begun construction of a simple new home but could not finish because of financial difficulties. That’s when FCH Armenia stepped in. With the help of a 12-member Fuller Center Global Builders team from St. John Armenian Church of Greater Detroit led by Jacqueline ElChemmas, the Manoukyans finally realized their dream of owning a decent home. “As Armenians in the Diaspora (Armenian communities outside the country), we all have a strong desire to help Armenians in our homeland,” ElChemmas said. “We are fortunate that St. John’s Armenian Church of Greater Detroit has a large community and that we have been able to sponsor each home we’ve worked on. In this summer alone, Fuller Center Armenia has had build days with Armenia Marriott Hotel Yerevan, KPMG Armenia, AGBU Discovery Armenia Youth Program, AGBU Canada, IREX Armenia, Future Leaders Exchange Program and Christian Youth Mission to Armenia. FCH Armenia also is going on its third year partnering with the International Committee of the Red Cross, a partnership that alone has helped 18 families obtain decent housing. It is no wonder that FCH Armenia Resource Development Manager Gohar Palyan expects momentum to keep building. Click here to support our work in Armenia.